Students will learn to pronounce the correct consonant sound when seeing the letter associated with that sound. Students will learn to identify the correct consonant letter when hearing the sound associated with that letter. When spoken words are converted to print, each sound is represented by letters of the alphabet. This phenomenon is called letter/sound correspondence. 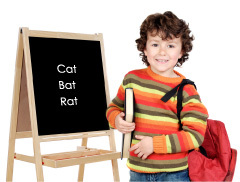 In order to read, students must be able to pronounce the correct sounds when viewing the letters of a word. In order to write, students must be able to segment words into their component sounds and represent those sounds with letters. This song gives students practice in connecting letters and sounds, beginning with the consonants b, d, f, g, h, j, l, m, n, p, q, r, s, t, v, w, y, and z, in both capital and lower-case forms. Students can practice pronouncing sounds while pointing to letters in the Mini-Charts. They can also practice recalling the letters while singing the sounds, without looking at the Mini-Charts. Once the basic song is learned, some of the more variable consonant sounds can be introduced, while singing to the instrumental track. Examples: the /s/ sound, (represented by letters s or c), the /k/ sound (represented by letters c or k), and the /j/ sound (represented by letters j or g). Alternate song lyrics for these variable consonants are found in the Follow-Up section of the lesson plan. Note: If you do not have the CD or Mini-Charts, you can still teach this initial consonants lesson plan using the folk tune listed on the What’s That Sound? Song Lyrics page. You can create your own mini-charts using the words in bold print letters in each verse of the Song Lyrics. Repeat Step 5 with Mini-Chart pages 28-31. Play CD Track 3 (What’s That Sound?) and sing the song. The teacher sings the questions and points to the letters. The students sing the answers, identifying the letters. Play CD Track 3 again and ask the students to join in the singing. Allow some students to point to the Mini-Chart letters during the singing. Try singing the song without the Mini-Charts and note which letters students have difficulty matching to the sounds you sing. These are the ones that should be reviewed with the Mini-Charts before singing the song again. Practice singing What's That Sound? daily for a few days. Then allow some of the students be the leaders, pointing to the letters and singing the questions. For every set of facing pages, choose 1-3 students to sing the questions. Using the instrumental version (Track 4) vary the order of the consonants on each page. Instead of singing the top, middle, and bottom letter sets in order, try singing the bottom, middle and top letter sets or middle, top, and bottom sets. See if the students can still identify the letter sets by their sounds. Introduce three of the more variable initial consonants by singing the following verse with the instrumental track. /k-k-k/ What’s that sound? Could be c or k.
/j-j-j/ What’s that sound? Could be g or j. /s-s-s/ What’s that sound? Could be s or c.
Oh, what fun it is to sing our letter sounds this way! To provide the visual link to print, duplicate the 3-lined Mini-Chart template. Write Cc on the top line and Kk on the top line of the facing page. Write Gg on the middle line and Jj on the middle line of the facing page. Write Ss on the bottom line and Cc on the bottom line of the facing page. To the left of each line, place a labeled picture beginning with the first consonant set. To the right of each line, place a labeled picture beginning with the second consonant set. Suggestions: For the /k/ sound, you might use a picture of a cat on the left and a kite on the right; for the /j/ sound, a giraffe on the left and a jack-o-lantern on the right; for the /s/ sound, a snake on the left and a circle on the right. Point to the appropriate letter sets as you sing. Introduce the Read-and-Sing Book, What's That Sound?. Challenge children to point to the appropriate items as they sing (ex. bread, doughnuts, and flour for the sounds of b, d, and f). Help children think of other categories of words to illustrate the sounds in the song such as animals (bird, dog, fish...), actions (bend, dance, fly...), or household objects (bed, door, floor...). Keep a few copies of the book at a literacy center equipped with headsets so that students can gain practice in listening, singing, and remembering the sounds of the consonants. Display consonant letter sets on walls around the room. Ask students to bring in pictures from newspapers, magazines, advertisements, or other sources and place them under the appropriate letter set. You might use the following starter set, using computer clip art or pattern books for the graphics: Bb-boys, Dd-dog, Ff-fish, Gg-girls, Hh-house, Jj-jam, Kk-kittens, Ll-lawn, Mm-mouse, Nn-newspaper, Pp-pig, Qq-queen, Rr-rabbit, Ss-sun, Tt-tiger, Vv-vegetables, Ww-walrus, Zz-zebra. Play Concentration with consonant letter cards and matching pictures. Match letters with the repeating sounds in alliterative poems like Jack Prelutsky’s The Yak (Random House Book of Poetry) or Dr. Seuss’ Oh, Say Can You Say. Students read all the letters on Mini-Charts pp.26-31 and pronounce the corresponding sounds. Students write or select correct consonant letters when hearing the sounds /b/, /d/, /f/, /g/, /h/, /k/, /l/, /m/, /n/, /p/, /q/, /r/, /s/, /t/, /v/, /w/, /y/, /z/.